South Korean stocks ended almost flat after a choppy trading session on Friday, with foreigners scooping up tech shares, offsetting a massive selling spree by institutions, analysts said. The Korean won fell against the U.S. dollar. The benchmark Korea Composite Stock Price Index inched up 2.07 points, or 0.09 percent, to close at 2,186.95. Trade volume was moderately light at 291 million shares worth 4.85 trillion won ($4.29 billion), with the number of losers outnumbering gainers 517 to 301. Institutions offloaded a net 300.5 billion won worth of local stocks, while individuals and foreigners were net buyers snatching up 47.1 billion won and 247.3 billion won worth of shares, respectively. On Thursday (local time), the US stock market rallied as major tech shares surged, with the Dow Jones Industrial Average jumping 0.84 percent. The S&P 500 increased 1.09 percent, and the Nasdaq Composite Index rose 1.42 percent. After opening higher, the Seoul index fluctuated between negative and positive terrain before closing almost unchanged. 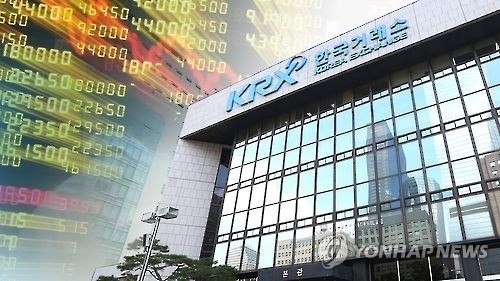 “The KOSPI started strong but closed almost flat due to massive selling by institutions,” said Lee Young-gon, a researcher from Hana Financial Investment Co., adding that foreigners scooped up chip shares but that buying was limited by the wait-and-see stance taken by investors amid uncertainties both at home and abroad. Large caps on the KOSPI had mixed fortunes. Tech shares ended higher, with top cap Samsung Electronics ending at 46,550 won, up 1.53 percent from the previous session‘s close, to continue a four-day winning streak. Global chipmaker SK hynix added 0.26 percent to reach 76,100 won. Mobile carriers ended mixed, with No. 1 player SK Telecom increasing 1 percent to 252,000 won and second-largest carrier KT unchanged at 27,950 won. LG Uplus, the smallest of the nation’s carriers, was up 2.03 percent to 15,050 won. Auto stocks also ended mixed, with leading automaker Hyundai Motor down 0.8 percent to 123,500 won. Its sister company Kia Motors increased 0.88 percent to end at 34,500 won, and auto parts maker Hyundai Mobis was up 0.47 percent to 214,500 won. Earlier in the day, shareholders of Hyundai Motor and Hyundai Mobis backed the dividend plans of the two automotive firms and their proposed directors but rejected proposals by Elliott Management. The local currency closed at 1,130.1 won against the greenback, down 2.4 won from the previous session‘s close.